Bring visuals to life in breathtaking 4K format, with resolution up to 3840x2160 dpi. Present in more than one billion colors with crisper lines, sharper contrasts and more subtle shading, so every member of your audience — from the first row to the last — sees everything with impeccable clarity. 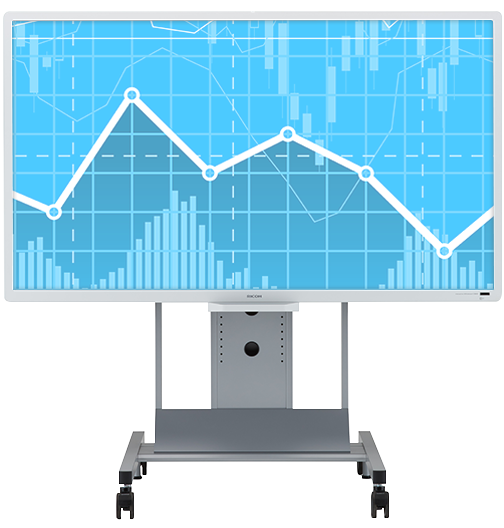 The interactive whiteboard even masks glare and offers a blue light mode to reduce strain on your eyes. Starting your presentation is no problem at all. Do it without additional software, calibrations or IT support. You don't even need a LAN connection. Use it with a wide range of Windows ®, Mac and Android® devices, including smartphones, tablets and USB flash drives. Take advantage of the RICOH Smart Device Connector app to print your presentation, along with edits and markings, via our Universal Print Driver.